For max accuracy you need consistent bullet position relative to the start of the barrel’s rifling. You can set this by trial and error, but it is much easier (and more repeatable) to use the Hornady O.A.L. 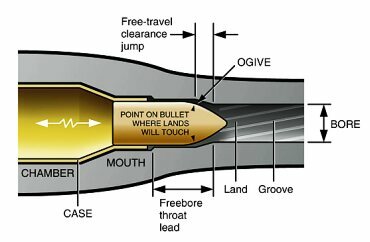 Gauge to measure case length with the bullet ogive just touching the lands. When combined with a Bullet Comparator (with caliber-specific insert), you can also very quickly measure case base to ogive for any loaded round. The Hornady system (formerly Stoney Point) consists of the O.A.L. 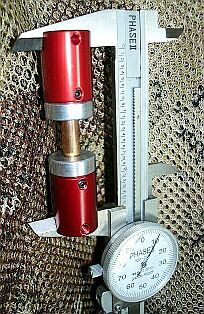 Gauge, a red aluminum tube with a plastic internal pusher rod, and a “Modified Case”, a 6mm BR case that has been bored and threaded at the base. This screws on to the end of the O.A.L. Gauge, and is sold separately by caliber. Though not essential, we also strongly recommend you get a Hornady Bullet Comparator. This Comparator attaches to the jaws of your calipers and lets you make readings off the bullet ogive. When using the unit, you should take measurements from 3 or 4 different bullets (in each box), since there will be minor bullet to bullet variances. It also takes a little practice to get the right “feel” for putting the bullet in contact with the lands. We go for a fairly firm seat, sliding the bullet until we feel resistance, then tapping a couple times on the gray rod while holding the Red Gauge body firmly against the mouth of the chamber. That usually gives very consistent results, if you start with a clean bore. When repeatedly measuring with the same bullet, the OAL normally is within .001″, 8 times out of 10. We’ve also found it helps improve results if, prior to measuring, you insert the tool with the Modified Case attached until it fits flush with the outside of the chamber, then rotate it a bit clockwise and counter-clockwise. That tends to remove any fouling build up. Also every time you measure with the tool, make sure the Modified Case is screwed on tight. It can tend to unscrew a bit as you remove the tool from your rifle’s chamber (see bottom photo). If the Modified Case is not fully seated on the O.A.L. Gauge, measurements will vary. We’ve listed a “street price” of $53.00 which will cover a straight O.A.L. gauge, a modified case, a Bullet Comparator body, and a caliber insert. It’s not a bad idea to buy the Bullet Comparator Basic Set (Item #B234-678, $26 at MidwayUSA). 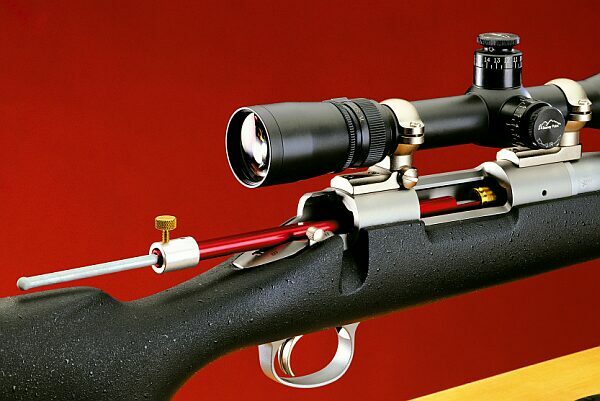 This lets you measure a variety of calibers (.223, .243, .264, .277, 7mm, and .308). Then, by adding a second Comparator body ($14) and second 6mm insert ($3.50), you can sort individual bullets by bearing surface length (ogive to bottom of max diameter). See how this works in the photo above. You can sort bullets very quickly this way. We have found, in many guns, sorting bullets by base to ogive improves accuracy more than by sorting by bullet-weight alone. The next point is important–we recommend you keep a 36″ piece of wood dowel in the bore. This helps seat the bullet more consistently and it lets you tap the bullet out easily if it sticks in the lands. Since firm contact with the lands produces the most repeatable measurements, you really need to have a long dowel handy. A cleaning rod will work in a pinch, but it is more likely to harm the delicate crown of your rifle. Stoney Point’s “Tech Tips” confirms: “When using the OAL Gauge we have found the most accurate results come when using a wooden dowel inserted through the muzzle of the firearm. 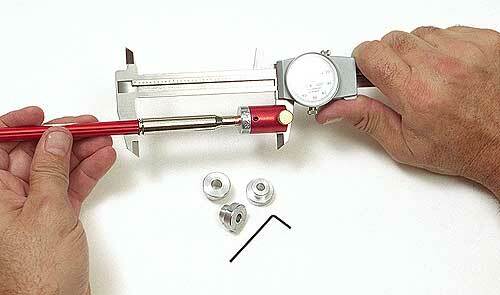 This allows you to ‘sandwich’ the bullet between the dowel and the bullet push-rod in the OAL Gauge. Then it’s easy to jockey the bullet back and forth as you feel the ‘stick-point’ of the bullet on the rifling. Lock in this ‘stick-point’ for repeatable results.” Just be sure you remove the dowel before you shoot the rifle! Another benefit of the Stoney Point measuring system, if you keep good records, is that you can track throat erosion. Often you will find OAL to lands grows .003-006″ very quickly in the first 100 rounds or so as burrs or chatter-marks polish out, but then it stabilizes. But regular use of the OAL gauge will let you “chase the lands” to keep bullet position constant relative to the entrance to the rifling.